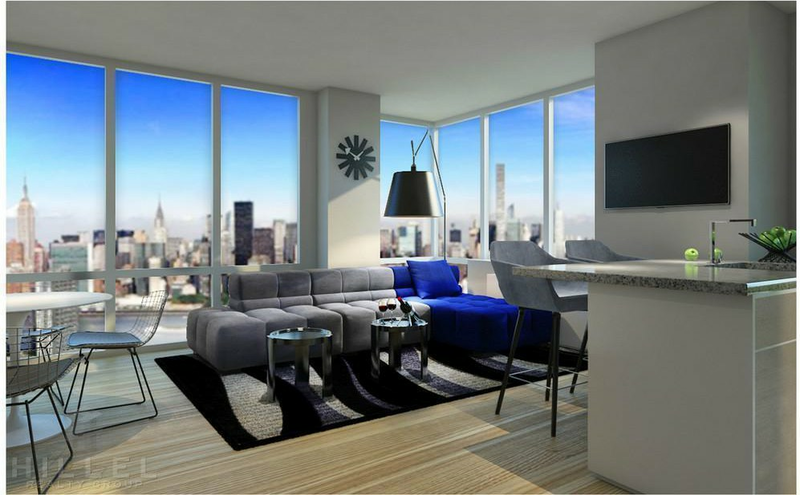 Renting in Long Island City: What will $2,700 get you? Curious just how far your dollar goes in Long Island City? According to Walk Score, this New York City neighborhood is extremely walkable, is very bikeable and boasts excellent transit options. Data from rental site Zumper shows that the median rent for a one bedroom in Long Island City is currently hovering around $2,790. Listed at $2,700/month, this studio apartment is located at 43-25 Hunter St. The building has garage parking, shared outdoor space, a fitness center, a roof deck, concierge service, a dog washing station, an elevator, extra storage space and on-site management. In the unit, you can anticipate hardwood floors, high ceilings, a dishwasher, stainless steel appliances, granite countertops, wooden cabinetry, a breakfast island, in-unit laundry and a balcony. Pet owners, take heed: both cats and dogs are permitted. Next, there's this one-bedroom, one-bathroom apartment located at 29-11 Queens Plaza North. It's also listed for $2,700/month. Building amenities include on-site laundry, shared outdoor space, a fitness center, a roof deck, an elevator, extra storage space, secured entry and on-site management. In the apartment, there are hardwood floors, high ceilings, a dishwasher, stainless steel appliances, designer cabinetry, a breakfast bar and floor-to-ceiling windows. For those with furry friends in tow, know that cats and dogs are allowed on this property. Check out this one-bedroom, one-bathroom condo that's located at 41-26 27th St. It's listed for $2,700/month. The building has on-site laundry, garage parking, a residents lounge, a business center, shared outdoor space, a swimming pool, a fitness center, a yoga studio, a roof deck, an elevator, secured entry and on-site management. In the furnished unit, you'll have hardwood floors, high ceilings, large windows, a dishwasher, stainless steel appliances, in-unit laundry, a walk-in closet, garden access and a balcony. Animals are not permitted. Located at 41-18 Crescent St., here's a one-bedroom, one-bathroom apartment that's listed for $2,700/month. The building boasts on-site laundry, garage parking, outdoor space, a fitness center, a roof deck, an elevator and extra storage space. Apartment amenities include hardwood floors, high ceilings, a dishwasher, stainless steel appliances, granite countertops, wooden cabinetry and a balcony. Sorry animal lovers, cats and dogs are not welcome.